Electronic Media offers student-led, staff-directed professional assistance for your campus audio, video, and media production needs. Electronic Media is Evergreen's one-stop-shop for campus media production support. EM has the experience and capability to provide affordable-yet-professional media services campus-wide, including event support and recording. The best way to get an accurate and timely estimate is to use our Production Request. Please fill out the request information as thoroughly as possible, specify that you'd like an estimate, and a producer can use as a baseline for estimate generation. Electronic Media charges for equipment packages, not by individual items. Our goal is to make charges straight-forward and clear to clients. This also allows for us to focus on doing a quality job with our production work. The vast majority of our support is on-campus for the Evergreen community. If you have an off-campus need, please contact a producer directly. Events that charge admission must always be charged back - even if admission is on a donation basis, and/or if the event is academic in nature. Post-production and editing charges are added as additional hourly student labor, usually between one and two hours per event hour. This means that a two hour video document may take 2-4 hours of editing and exporting. Want to learn more? Take a look at what we do on our Production page. If you have additional questions about your future production, please contact Audio/Media Producer Ben Hargett for more information. The bulk of our production support is done by highly-trained student crews, often including Evergreen Media Interns. Our crews typically work in teams of two or more students, especially outside of normal business hours; depending on a production's technical complexity and ourstaffing availability, additional student and staff labor may be required. Large, complex events can require multiple staff and students. For basic events, please plan for at least two hours of setup and one hour of teardown time in addition to the event run time. Depending on event timelines and complexity, setup and teardown may take additional time and need additional space reservations. The following tiers represent baseline prices for equipment use, and are charged as a daily flat rate per setup. Multiple setups on the same day will be charged separately. Audio Cart PA ($80/setup, plus labor): Most campus audio events can be supported by our basic PA rigs, each of which consists of a custom purpose-built cart that comes with two speakers, two wired microphones, two wireless microphones, and support for playback from mobile phone and laptops with headphone jacks. Audio Cart PA w/ supplements ($120/setup, plus labor): Mid-sized events, such as panels, intermediate-sized lecture events, and small concerts, are supported with a beefed-up audio cart rebuilt with a larger mixer, additional microphones, speakers, and other equipment as needed. Large-scale Custom PA ($300/setup, plus labor): Large-format audio support includes large speaking engagements, concerts, recitals, recording sessions, and other complex events. Supporting large events requires long-term planning, significant resource use, and staff oversight. Event and post-production labor charges are not included (see above for labor pricing). Please contact the Audio/Media Producer, Ben Hargett, for more information. The following tiers represent baseline prices for equipment use and charged as a daily flat rate per setup. Multiple setups on the same day will be charged separately. Field Kit w/ Sony Professional Camcorder ($150/setup, plus labor): Our most basic video offering, the workhorse "single cam" setup is perfect for archival recordings. Digital Cinema Camera ($200/setup, plus labor): Our so-called "Fancy Cam," used for interviews and other controlled settings requiring more cinematic flair. This camera needs a specialized operator, so advance planning and coordination is required. Two Cameras ($250/setup, plus labor)​: Our most popular video production tier! Same as above, but much more interesting and dynamic for the viewer. Video documentations at this level and above are often "live-switched" with a director and small crew, so shots are intentional and synchronized; post-production turnaround is also significantly improved over non-switched footage that requires major editing. Three Cameras ($400/setup, plus labor): Three cameras, aka the "Multi-Camera Shoot." Three cameras, live-switched and directed, the whole kit-and-kaboodle. For crafting high quality, polished video documents. CCAM TV Studio Production (Ask for quote): Multi-camera Studio Extravaganza! 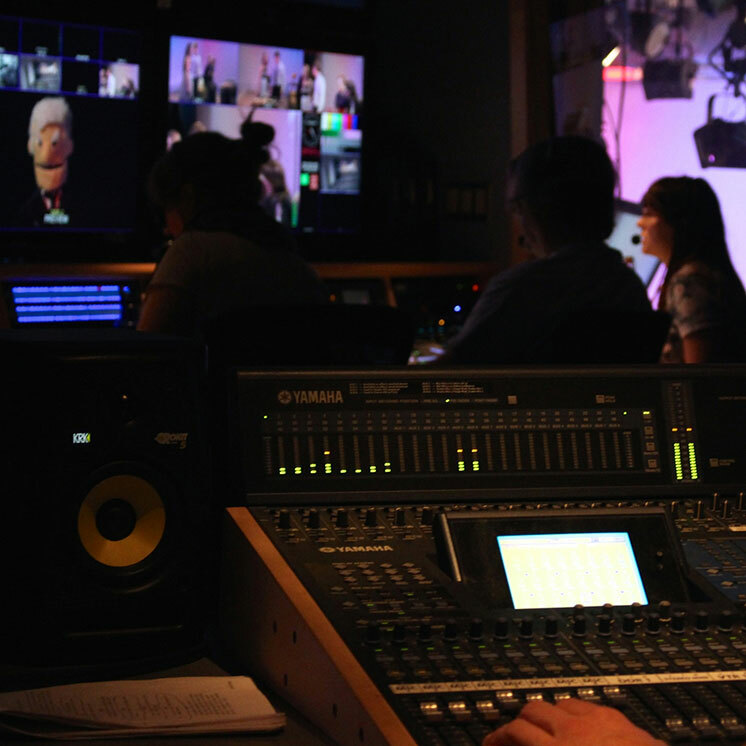 Come use our flagship TV Studio facilities for the best production quality on campus. In certain spaces and under certain circumstances, a single computer feed can be incorporated into Tiers 2, 3, and 4 at no additional charge. Event and post-production labor charges are not included (see above for labor pricing). For more information, please contact Dave Cramton, Video Producer and CCAM Manager. The below chart outlines basic costs for data projection. If requested in advance, Electronic Media can provide a laptop from which to run projected material; client laptops can also be accomodated. All playback requirements (including any synced or non-synced audio) must be communicated in advance. Large Tripod Screen w/ small projector ($120/setup, plus labor): A basic 8' square tripod screen, ideal for small or auxiliary setups. 9' x 14' Screen w/ high-lumen projector ($250/setup, plus labor): Our "Small Giant" screen. This full-framed-with-legs screen is capable of front or rear projection, and able to fit in mid-sized spaces such as the Library Lobby. It has excellent viewing angles and elevation, and is an ideal accessory for moderately-sized events. Please be aware that this screen requires a crew of four to set up and strike, and will impact labor accordingly. 11' x 19' Screen w/ high-lumen projector ($325/setup, plus labor): The biggest screen in EM's inventory, the "Giant Giant" screen! This massive screen is ideal for displaying content and Jumbotron'ing at large-scale events. It is for front projection-only. ​Additionally, the 11' x 19' screen can be hung from the ceiling for CRC events (for an additional $150 charge per hang). Please note that setup and teardown time for the two large screens is significant, and requires a team of four-to-six crew. Overall labor for setup and teardown can be two hours in total, and increases further when the screens are flown. Please contact the Audio and Media Producer, Ben Hargett, for more information. Materials (CDs, DVDs, videotape, etc.) are charged on an as-used basis. Additionally, video content produced by EM now carries a $20 storage surcharge (per production) to help cover storage costs. Looking for general production tips? Check out our Production Planner. Tech Talk: What is live streaming? EM charges were most recently updated on July 1, 2018, and should be current for the 2018-2019 Academic Year. However, all charges subject to periodic updates and changes. Contact a producer for more accurate cost estimates.